Stocks have soared to record levels this year, but one brokerage firm says there are still plenty of profits left to mine. After the market's stellar first-quarter gains, UBS (UBS) is out with a new list of favorite stocks. According to 24/7 Wall Street, UBS names 14 stocks for which it sets target prices at least 25 percent above current levels. Some are household names like Citigroup (C) and Delta Air Lines (DAL), but there are a number of companies on the list that you may not be familiar with. There are two energy-related stocks – Halliburton (HAL) and Cobalt International (CIE). 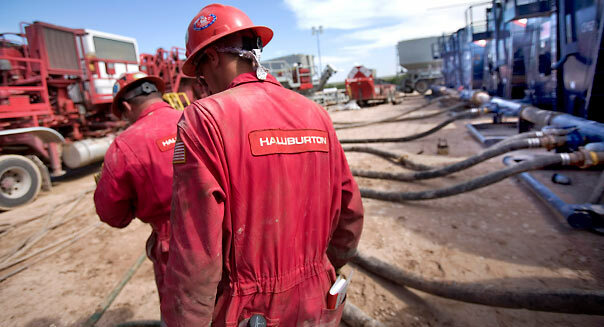 Halliburton shares have already jumped 15 percent this year, but the UBS price target sees it gaining another 33 percent. Robert Nickelsberg/Getty ImagesTwo employees of Halliburton Company moves between large pump trucks at a natural gas well site. Delta is another one that has soared already this year, up 37 percent. It's the only transport company to make the list. There are a couple of others that have also had good runs already this year. Newcastle Investment (NCT), a real estate investment trust, is up 26 percent. And software maker Infoblox (BLOX) has gained 18 percent. It went public a year ago. UBS also has a pair of drug and bio-pharmaceutical companies on the list. Warner Chilcott (WCRX) may be a bounce-back story. Its shares have lost 40 percent of their value since last May, and it recently warned that earnings this year are likely to fall short of Wall Street estimates. Alexion Pharmaceuticals (ALXN) is another against-the-grain pick. Last week it received a warning letter from the FDA, which said the company has failed to comply with good manufacturing practices. Along the same line, UBS likes Monster Beverage (MNST), even though the company has been under fire recently because of possible links between its energy drinks and health problems. Arch Coal (ACI) is the lowest priced stock on the list, trading just above $5 a share. The UBS target is $9. Like other coal companies, Arch has cut production at several mines because of weak demand for coal-based electricity. The stock has tumbled 29 percent so far this year. Rounding out the list are Whole Foods (WFM), the retailer Ross Stores (ROST), TIBCO Software (TIBX), and Kraton Performance Polymers (KRA).